This project was created on 10/02/2017 and last updated 2 years ago. Paralysis is the loss of voluntary muscle control. Over five million people in the United States and eighty thousand in Canada suffer from paralysis. Many paralysed people cannot move a single part of their body Even though these people are cognitively aware, they have no means of communication. They have lost their ability to talk, type, etc. These victims have their thoughts and ideas trapped inside of them. Generally, people with paralysis have control over their eye movement. Therefore, the purpose of this project is to build a real time interactive system that allows paralysed people to easily express themselves, via eye blinks. Paralyzed people lack the ability to control muscle function in one or more muscle groups. The condition can be caused by stroke, ALS, multiple sclerosis, and many other diseases. Locked-in Syndrome (LIS) is a form of paralysis where patients have lost control of nearly all voluntary muscles. These people are unable to control any part of their body, besides eye movement and blinking. Due to their condition, these people are unable to talk, text, and communicate in general. Even though people that have LIS are cognitively aware, their thoughts and ideas are locked inside of them. These people depend on eye blinks to communicate. They rely on nurses and caretakers to interpret and decode their blinking. Whenever LIS patients do not have a person to read their eye blinks available, they have no means of self expression. BlinkToText offers a form of independence to paralyzed people. The software platform converts eye blinks to text. Every feature of the software can be controlled by eye movement. Thus, the software can be independently operated by paralyzed people. Using the software, patients can record messages, recite those messages aloud, and send the messages to others. The software can be run on any low end computer, from a Raspberry Pi to an IBM Thinkpad. The software uses computer vision and Haar cascades to detect eye blinking and convert the motion into text. The program uses language modelling to predict the next words that the user might blink. The software can be easily customized for each patient as well. 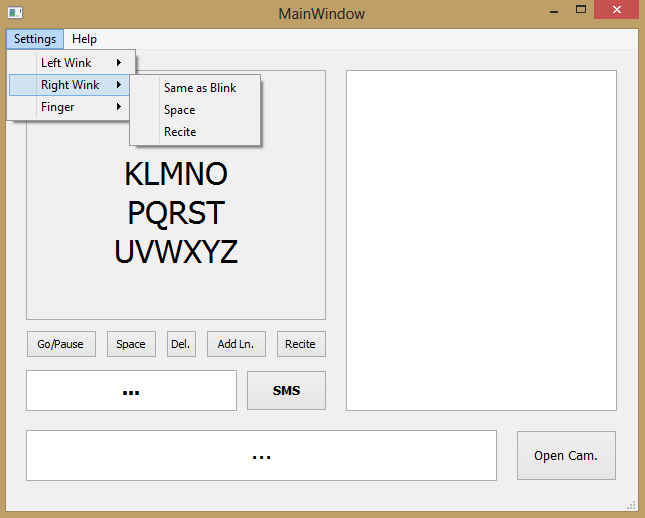 Blink to Text is free open source software. It is distributed under the MIT Permissive Free Software License. Allow paralysis victims to communicate independently. Many paralysis victims already use eye blinks as a form of communication. It is common for nurses and caretakers to read a patient’s eye blinks and decode the pattern. The ALS association even offers a communication guide that relies on eye blinks. BlinkToText automates this task. The software reads a person’s eye blinks and converts them into text. A key feature of the software is that it can be started, paused, and operated entirely with eye blinks. This allows patients to record their thoughts with complete independence. No nurses or caretakers are required to help patients express themselves. Not only does this reduce the financial burden on paralysis patients, but this form of independence can be morally uplifting as well. Be accessible to people with financial contraints. Many companies are developing technologies that are controlled by eye movement. These technologies rely on expensive hardware to track a user`s eyes. While these devices can absolutely help LIS victims, they are only available to people that can afford the technology. BlinkToText focuses on a different demographic that are often ignored. Twenty-eight percent of U.S. households with a person who is paralyzed make less than $15,000 per year. BlinkToText is free and open source. The software runs on wide variety of low end computers. The only required peripheral is a basic webcam. Not only is this software accessible to paralyzed people, but paralyzed people of almost all financial classes as well. Blink to Text is free open source software. It is distributed under the MIT Permissive Free Software License. All of the code is available on Github. A majority of the software is written in Python. Specifically, the image processing is done with Python’s OpenCV library and the GUI was made with PyQT. Python is an open source programming language. This means that all .exe and other distributables of the software can be decompiled. All of the Haar Cascades were obtained from OpenCV’s repository of free and open source Haar Cascades. 1 × 64-bit Windows 8 Dell Inspiron Laptop Intel Core i5-4200U CPU @ 1.60GHz 2.30 GHz and 4.00 GB RAM. I have finished a second major upgrade of the software. The demo video demonstrates the new sound effect feature. The user can send their blinked message as an SMS via the SMS Button. For future development, I would like to improve the blink detection algorithm. I want to make the software work better at long distances. I have made two major updates to the software. Whenever the software recognizes a blink, it emits a beep sound effect. The beep sound effect let&apos;s a user know that their blink has been detected. The software has a customization feature. BlinkToText is built around blink detection because almost all people with severe paralysis retain that ability. If a paralyzed person can conduct other body movements as well, the software should take advantage of that. With the customization feature, users can set certain actions as hot keys. If the program detects a certain body movement, it will automatically do the preset function. Currently, the software can detect three additional actions besides blinking. Users can use these body movements to trigger any of the button functions. Additionally, users can use any of these body actions instead of blinking, with the Same as Blink Option. Everyone’s disability is different. Ideally, every disabled person would have a custom made solution for their problems. Unfortunately, this option is outside of the financial constraints of many families. BlinkToText offers a partially customizable system that works for most people. I have developed a program that allows users to convert eye blinks to text. There are many things that I would like to change about the software, but I do have a demo version ready. You can view the demo below. The software automatically cycles through a series of rows. If the user blinks, the software iterates through each element of the selected row. To differentiate between intentional and unintentional blinks, the software only recognizes blinks that last longer than 1.25 seconds. The user can select an element by blinking again. The user can view themselves with the camera feature. The user can recite her/his text using the recite button. I feel that the software would make a good note taking tool for paralysed people. A series of notes can be amassed in the right dialog box. The software speeds up note taking by predicting the next word that the user might blink. The Go/Pause button allows users to start and stop note taking at will. A key goal of the program is that it can be operated with complete independence by paralysed people. With the Go/Pause button the program can be run at the user’s discretion. A computer can be set at the end of the user’s bed/ wheelchair, etc so that they can express themselves as they please. I had many ideas for the text selection. I was not sure what the most convenient way to select text would be. An acquaintance suggested copying a nine digit cell phone pad. I looked into the Minuum keyboard system, as well. I learned about the row column method in an unusual way. I was watching a video clip of Breaking Bad, and noticed one of the actors communicate using a text chart. I was disappointed by the nurse not being able to understand the patient. I believe if the man could operate the chart independently, he would not have that problem. Currently, the GUI’s Nurse Button has no programmed function. Eventually, I want the user to be able to send their message as a text, email, and/or something else. The Nurse Button is for that purpose. There are a lot of improvements that I would like to make to the interface. I hope that I can finish all of these improvements before Oct. 16/17. I would like to make the button font size significantly bigger. Ideally, bedridden patients would be able to use the software by having a computer permanently placed at the foot of their bed. Currently, the text is readable from five feet away with 20/30 vision. Unfortunately, stroke and other diseases that cause paralysis can also affect vision. The software should be accessible to people with poor vision, as well. I think sound effects would improve the user experience. I tended to keep my eyes closed for longer than needed in the demo. If a sound effect signalled when a blink was detected, I could open my eyes sooner. I will house the application in a desktop app. If the application is easy to install, I figure it will be almost as accessible as a website. I have made the GUI using PyQt. It is important that all GUI functions are controllable by eye blinks. Paralysed people must be able to use the software with complete independence. I want the entire application to be housed inside of a website. That would make it quite easy for anyone to access the software. I built simple interface for this website. The website can accessed at this link. I am having difficulty getting the front end to talk to my python program. I need the python program to run on the client side. AJAX calls do not seem to have the speed that I need. I have developed a simple python program that can detect eye blinks. The program uses the cv2 library to handle the image processing. I am using a facial Haar Cascade to detect a face within the videofeed. I then detect eyes using another Haar Cascade within this region of interest. If the eyes disappear for a certain period of time, then the program assumes that the person blinked. Quickly, I noticed that I unintentionally blink a lot. Ergo, my program only recognizes a blink if it lasts longer than 1.25 seconds. Thus, unintended blinks are filtered out. The program can also detect winks and differentiate left eye winks from right eye winks. I think this adds an exciting option for customization. Users can use winks as hotkeys to transmit specific data. For example, winking could let the user instantly delete the last transmitted word. Instead of using a Haar Cascade to detect when an eye is open, I would rather use a Haar Cascade to detect when an eye is closed. Or both. I believe that this would make the program more precise. I am looking into training my own Haar Cascade to serve this function. This is not a vital task because the eye blink detector is already fairly accurate. There are multiple ways to detect eyes in a video. This is a relatively new problem, so the standard technique has not been established. I have researched different methods, all of which have their own pros and cons. I hope to give a brief synopsis of each technique below. Eye blinks can be detected by referencing significant facial landmarks. Many software libraries can plot significant facial features within a given region of interest. Python’s dlib library uses Kazemi and Sullivan’s One Millisecond Face Alignment with an Ensemble of Regression Trees to implement this feature. The program uses a facial training set to understand where certain points exist on facial structures. The program then plots the same points on region of interests in other images, if they exists. The program uses priors to estimate the probable distance between keypoints . The library outputs a 68 point plot on a given input image. For eye blinks we need to pay attention to points 37-46, the points that describe the eyes. In Real Time Eye Blinking Using Facial Landmarks, Soukupová and Čech derive an equation that represents the Eye Aspect Ratio. The Eye Aspect Ratio is an estimate of the eye opening state. Based on Figure 2, the eye aspect ratio can be defined by the below equation. “The Eye Aspect Ratio is a constant value when the eye is open, but rapidly falls to 0 when the eye is closed.”  Figure 4 show a person’s Eye Aspect Ratio over time. The person’s eyeblinks are obvious. A program can determine if a person’s eyes are closed if the Eye Aspect Ratio falls below a certain threshold. Clmtrackr is another facial landmark plotter. In previous logs, I had attempted extracting accurate and consistent eye position data from the plot. Because of this experience, I am eager to explore completely different blink detection algorithms and techniques. Frame differencing is another blink detection technique. Essentially, a program compare subsequent video frames to determine if there was any movement in a select eye region. In most programs, the first step is to detect detect any faces in a videofeed using a face detector, such as the Viola-Jones Face Detector. The face detector returns a bounding box of an area that contains a face, as seen in Figure 5. The program then analyses this region of interest for eyes using a similar detection tools. The program places a bounding box on any regions of interest. The program then compares the difference the eye region of interests in subsequent frames. Any pixels that are different can plotted on a separate image. Figure 7 demonstrates a program using frame differencing to detect hand movement. A Binary Threshold and Gaussian Blur filter the images. Using pupils to detect eye blinks has a similar process to frame differencing. Once again, the program starts off by placing a bounding box on any detected faces within a region of interest. The program then detects general eye regions within the face bounding box. The program analyses the eye region of interest. The program runs a circle hough transform on this area. If the software can detect a circle roughly in the center of the region and that circle takes up roughly the right amount of area, the software assumes that the circle is the pupil. If the pupil is detected, then the software can assume that the eye is open. I have been trying to develop an accurate eye tracker in with Clmtrackr for a week now. Unfortunately, I cannot precisely detect eye movement to the degree that I require. At most, I am able to detect if the pupil is on the left side or right side of the eye. Even this small feat requires basic environment variables, such as lighting, to be constrained. I researched other software example that use Clmtrackr to detect eye movement. They seem to suffer from similar problems. This example eye tracker shares the same issues that my program has. I feel like Clmtrackr is not meant for the eye tracking that I require. Additionally, many of my acquaintances that have tried out the software felt eye strain after extended usage. I definitely do not want to make any patients that use the software uncomfortable. I get the feeling that using pupil movements to communicate long messages might cause some uncomfortable eye strain. From now on, I plan on using eye blinks as a means of communication, instead of pupil movement. There is already a long history of people sending long Morse Code messages through eye blinks. I have been testing python algorithms that detect eye blinks. My prototype programs have provided encouraging results. It seems like I can accurately detect if a person in blinking in a variety of environments. I am going to move away from Clmtrackr to OpenCV for my eye detection. Eventually, I believe I can host my python program in a Django website. Points 27 and 32 describe the centerpoints of the pupils. Currently, I am writing a software program that uses clmtrackr to detect faces in a videofeed. The software then measures the distance between the Point 27 and 32 and the four corners of each eye. If the length falls below a certain threshold, the program will know that the eye is in a certain corner. Almost all paralyzed people are able to move their eyes and blink. I want the software to detect pupil movement. A person can only blink their eyes, but they can move their pupils left, right, up, and down. People could transmit more information with less effort through pupil movement. Jason Becker came up with a convenient eye chart that helps people communicates words through eye movement. When using the chart, Jason moves his eye to the top left, top, top right, bottom left, bottom, bottom right corner of his eye. This action signals which group of letters he wants to pick. He then moves his eye up, down, left, or right to pick a specific letter. To communicate, Jason needs someone to read his eye movements and decode his message. A video of Jason using this system can be seen at the link below. This process can be automated. Using a computer vision algorithm, a webcam can track his eye movements. Ideally, this system will be non invasive. A camera will not need to be mounted to a person’s head. A person should be able to communicate their eye movement by looking at a laptop that is a reasonable distance away. A coefficient can be assigned to each letter depending upon the likelihood of the letter being selected. This coefficent can vary depending on the word being spelt. Hard- and software agnostic software tool to flash microcontroller. You are about to report the project "BlinkToText", please tell us the reason.